You are here: Home / Tutorials / Surface-Water data / How do I access historical streamflow data? 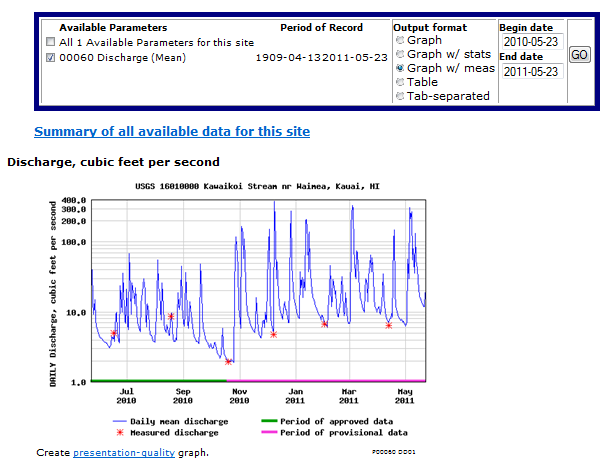 How do I access historical streamflow data? 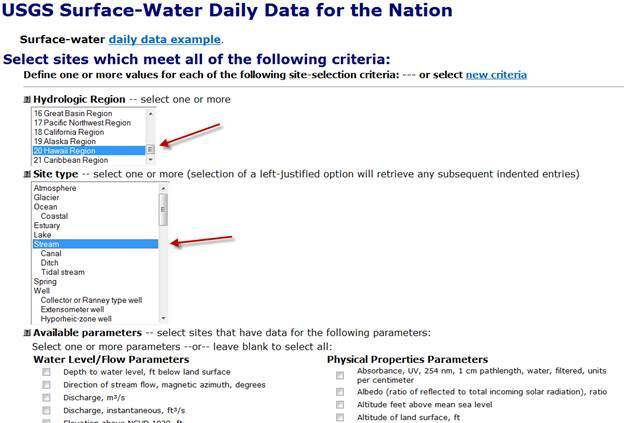 Start at the USGS Water Data for the Nation homepage. Click on the blue Surface Water button. Click on the blue Daily data button. 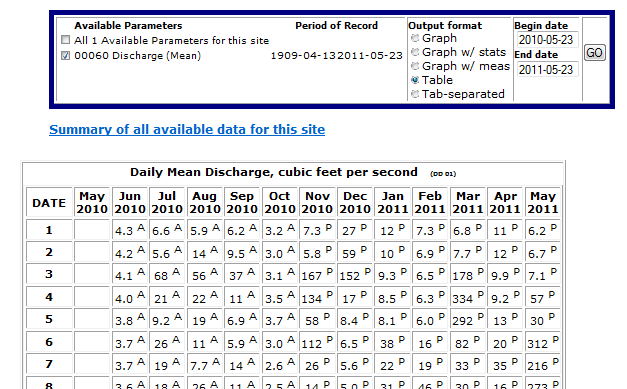 Search for sites with surface water daily data that meet particular search criteria. 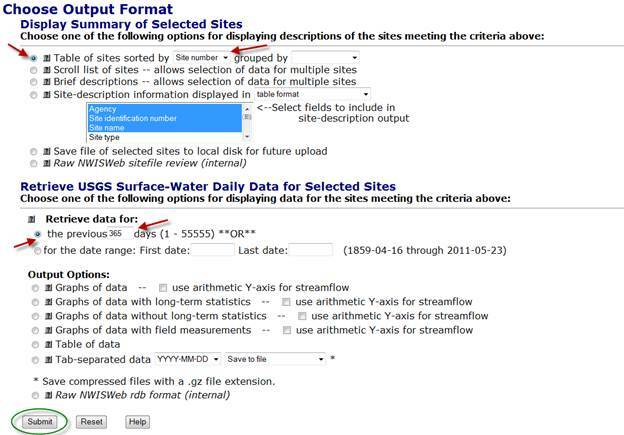 In this example, the search criteria include “Hydrologic Region” and “Site Type”. Click submit. Select the specific attributes for the retrieval. In this example, Streams in the Hawaii Region are selected doe site type and hydrologic region. On the same screen, select the desired parameters for retrieval. 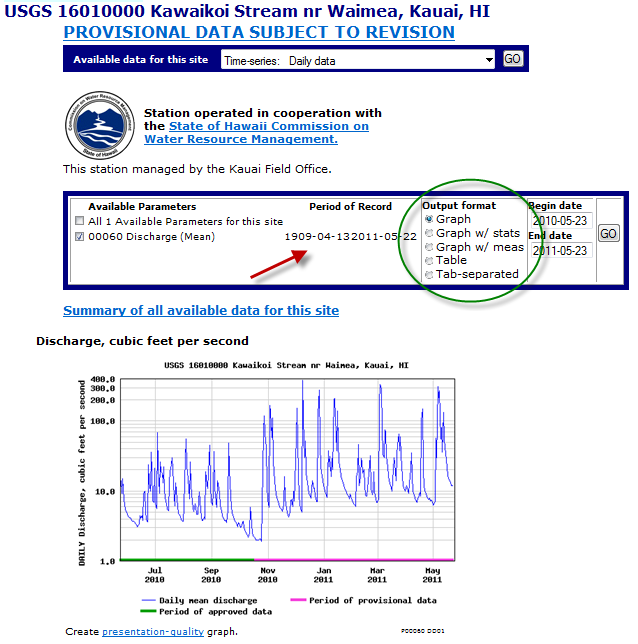 In this example, Streams in the Hawaii Region that include Streamflow, ft3/s are the selected criteria. Note: The parameters selection can be left blank to retrieve all available parameters. Also on the same screen, choose the desired output format. In this example, the display summary of selected sites is set to display as a Table of sites sorted by site number and will be retrieved for the previous 365 days. When the selection criteria have been chosen, click Submit. 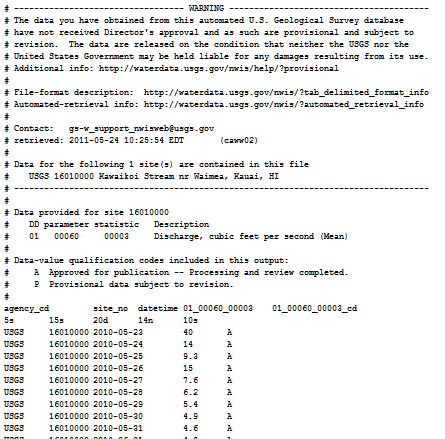 The next screen that loads shows the available parameter for the site and the period of record available for download. 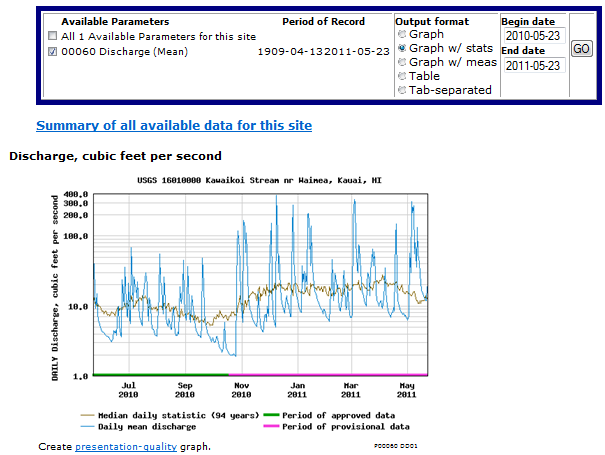 Note that the output format can be changed to include statistics or site measurements on the graph. A table of data and a file of tab-separated can also be selected. The tab-separated file can be imported to an analysis program, such as Excel, Access, or S-Plus for other analyses. Note, the screen captures below show the various outputs available.